Quick Summary : Art of Tea is an excellent online tea shop with a very extensive selection of loose leaf and pyramid bagged teas. Their website is easy to use, well organized and their teas are reasonably priced. The pricing at Art of Tea is quite affordable. Their sampler teas, which come packed in small tins, are in the $4 to $5 range at the time of this writing (December 2012). Larger tea order sizes range in price from $2.50 to $5 per ounce and are packed in lightproof, re-sealable pouches. Art of Tea has an large selection of teas. While their selection isn't comparable in size to Adagio Teas, few people will be disappointed in their selection, either. What I especially like about Art of Tea is that all their teas are available in small, affordable samplers. Too many tea shops only sell teas in quantities of 2 ounces or more, making it much more expensive to sample around to find the teas that you like. The quality of the leaves from Art of Tea is excellent. While I don't like every tea I try, it's not the quality of the leaves that is at fault. It's just that I don't like the taste! Their tea samplers come packaged in small tins that, once used, have all sorts of handy uses around the house and in the garage. And larger tea order sizes are packaged in recloseable bags that keep light out and are air-tight, too - insuring the tea remains fresh. Art of Tea has a very attractive website. The website is well organized and visitors will not have a difficult time navigating around. The photos they provide of their teas also are very good. However, I do have three "quibbles" with their website. My first quibble with their website, at the date of this writing, is that their site isn't especially "touch friendly," at least not on an iPad. Their main left side navigation menu on individual product pages does not have enough space in-between the items, making it somewhat difficult to "touch" the menu item you want without accidentally touching something else. The second problem I had with their website - again on a tablet - is that on their home page Art of Tea uses Flash. On an iPad, of course, Flash isn't supported, leading to a rather ugly and disjointed home page. Additionally, when selecting a category on their home page, the drop-down menu that appears is partially covered up by their customer testimonials, leading to an odd appearance. And finally, the drop-down menu again has too many menu items packed too closely together, making it difficult to select whatever item you want without accidentally touching something else. Finally, I found it odd that Art of Tea doesn't have a dedicated "herbal tea" page. Instead, they list their herbal teas under the "caffeine free" category. This is unfortunate, and not just because on my first order with them I missed this category entirely - and thus missed out on ordering their loose-leaf Cherry Amaretto Tea. The primary reason this is unfortunate is that many tea drinkers, such as me, will equate "caffeine free" loose leaf teas as de-caffeinated teas. In short, if you are looking for herbal teas on the Art of Tea website, look in the "caffeine free" category. I've only ordered once from Art of Tea once at the date of this writing (December 2012), but I have no complaints. Immediately after I placed my order I received a recipt via email. All items I ordered were shipped very quickly and arrived in good order. As I didn't have any issues with my order, I didn't utilize their customer care in any other fashion. Orders from Art of Tea generally ship within 1-2 business days after the order. My own order shipped in 1 business days and I received email notification that the order had been shipped. Free shipping is also offered on all order of $50 or more, at least at the time of this writing - although a coupon code (which is shown on the home page) needs to be used. I suspect, however, the dollar amount to qualify for free shipping probably changes depending on the types of promotions they run during the year. 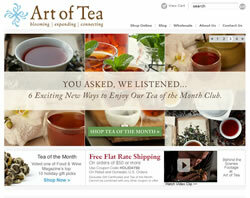 Overall, Art of Tea is a fine online tea shop. Their inexpensive samplers are a huge plus, allowing people to sample a wide variety of teas without breaking their bank account. While the web site has a few undesireable user features, especially for tablet users, and one odd categorization problem, overall I give Art of Tea a 5 Star Rating.